Butterfly Baby Place: Back to School!! My little dude started his first year of preschool this year, which motivated me to make him a little bag. 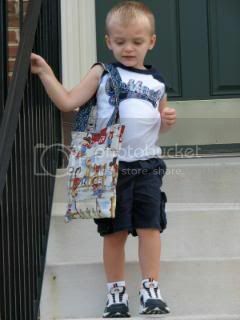 His school suggested using a tote bag instead of a back pack because it's a lot easier for preschoolers to use. That way, it's also easy for the teachers to stick papers and other things in when they have a line of students waiting to go. It's simple, but cute, and fun for my little guy. 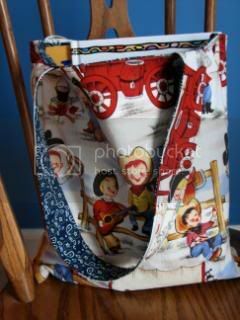 It can be made in any of my available fabrics... or shoot me an idea! Fall is going to be so fun!